Website personalisation. It’s the Holy Grail of marketing. The prince that is promised in every agency pitch. But all too often the reality of personalisation amounts to a handful of emails with your name on the top and maybe a welcome pop up message when you land on site. So how do we move beyond this to a level of website personalisation that's actually useful, without going too far and making users look over their shoulder when your ChatBot asks if they enjoyed the pizza they had for dinner last night? It's all about finding the right balance. I despair when I go to a website and receive a welcome message that reads ‘Welcome back Christopher Knowles’. It feels like I’m being told off by my Mum. It’s Chris, thanks. It’s even worse when I’ve used Facebook login to create an account for something. When I open the banking app on my phone though, I get ‘Hello Topher’. That’s a nickname reserved for my close friends. If I walked into a branch and they called me Topher, I’d probably question whether the cashier was an imposter. This level of personalisation isn’t creepy, it's just downright pointless. There may have been a time when it impressed people, back when we were all getting excited about adding moving backgrounds to our MySpace pages, but that time has passed. If you're going to use website personalisation, consider giving people a 'preferred name' option. You get it in person, you should get it online too. More effective website personalisation will happen in the background and your users won't even know they are being manipulated (or delivered a bespoke, tailored browsing experience, in agency speak). The last two are the most useful here, they allow us to really leverage the power of the HubSpot CRM and personalise a user's browsing experience. 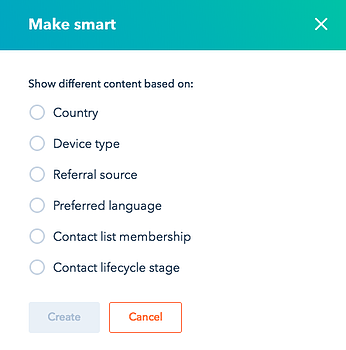 'Contact list membership' lets us segment users based on their browsing activity, while 'contact lifecycle stage' allows us to display content to somebody dependent on what stage of the buying process they are at. This gives us A LOT of information to work with. Has Mrs May viewed our case study on 'How to Fix the Country' three times already? Well then, let's add her to our 'Parliamentary Decision Makers' list and make sure our blog post on 'The top 10 ways to sell your country fixing vision' appears at the top of our blog page when she returns. Even better, make it pop up in a HubSpot lead flow to really increase its chances of grabbing attention. This can be developed over time. Each time a user converts on one of your offers, add them to a new list to reflect firstly that they have already seen that offer, but also that they are now a repeat customer who will want to see something else. The point is, you can be helpful without making a big song and dance about it. Show them events you are running in their area based on their location. Give them related articles or products based on previous browsing activity. Just don't shout about how your CRM knows they might like those things. This one should be a no-brainer, but in reality it's rarely used. If you're putting money into Google Searches that mention a particular product, or Facebook adverts that show somebody a product, make sure the journey is consistent when somebody clicks on the ad. Have you lured them in with a particular piece of artwork? Well, make it front and centre on the page they land on. Are you promoting your conversational marketing expertise? Great! Don't make them scroll halfway down the page to enter their details. If you're using targeting correctly in your paid advertising, you should already know which of your inbound marketing personas they will attract. If you know that, you know exactly the type of content that will appeal to them and the pain points you should be solving in your messaging. We love a good ChatBot here. Whether it's created on HubSpot Conversations or Drift, we see huge lifts in conversion rate when they are done well. However, this is also the area which has the most potential to be creepy. When using these platforms you have a lot of data at your fingertips. You know what country a user is (most likely) in, and some clues about their place of work based on their IP address. If they are a returning visitor, you probably also know their name, email address, phone number and perhaps even have their latest social media profile picture in front of you. DO NOT USE ANY OF THESE DETAILS. Or if you do, don't make it obvious that you have it. Nobody wants their personal information spat back out at them by a robot. Instead, your most precious bits of information are the ones you know they are already looking at. Use your marketing personas to ask the questions you know are already swirling around their minds. And do it with humanising language. Be the smiling Apple Shop assistant, not the slimy used car salesman. Keep your content focus on your core message and always ask yourself if this personalisation is useful or just a novelty. View it as a way of adding to and subtly improving your user's experience, rather than transforming it. If you're doing that, you're probably not being a creep.